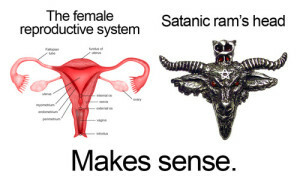 So long ago it was proven that women are evil because, duh, uteruses have horns. I’m not saying all science is terrible—it’s a pretty broad profession and, of course, used toward wonderful advancements. But scientists are still people coming from an oppressive culture, with their own ideas and—even though some may be subconscious—their own prejudices. And there’s quite the history of how it has been used to justify the dehumanization of women, especially working class women. Take, for instance, the early 1900s case of Margaret Sanger. Interestingly enough, at my last science lab, part of my assignment was to help a fictional lady, Jezebel (named after the Bible’s bad girl), figure out the father of her baby.